Back in April during the annual F8 developer conference, Facebook announced their latest innovation. Bots for the Messenger platform. It has become clear over time why Facebook forced us to download Messenger as a standalone app. Their aims and goals for what they want Messenger to be means it just couldn’t be tied into the main flagship app. Just to recap, Bots are automated systems which enable people to interact with brands via message without the business having to do a thing. It is aimed at being a more personal and an easier experience for the consumer while at the same time allowing brands to easily interact through automation. It is a smart move from Facebook in theory, more than 900 million people use Messenger every month and Facebook is processing around 60 billion messages per day. However, so far it has been a pretty poor experience. As we have noted previously, Facebook’s Messenger bots at launch sucked. They performed well below expectations. In fact, as reported by TechCrunch, very few of these chatbots are seeing widespread use. They just aren’t efficient or convenient enough to use in place of a main application. As well as that, Facebook is running the risk of there simply being too much. Over 11,000 bots have been launched on Messenger so far and over 23,000 developers are signed up to potentially launch bots. That is an insane amount of bots and the problem could end up being how to determine what is good and what is not. How do you know what to ignore and what is worth using? If Facebook wants chatbots to be a success on Messenger, they need to be more convenient than using the application. Otherwise there is simply no point in using them on Messenger at all! To help boost engagement with Messenger bots, Facebook is launching a new set of features. Facebook is adding quick replies to the experience to make it easier for brands to guide users through the bot process. Quick replies will provide possible options for queries which the bot is able to respond to. Up to 10 options can be shown and when one is selected the rest will disappear so that you can read the chat back easily at a later time. Facebook is also adding a ‘Persistent Menu’ option which is a listing of bot commands that can be opened at any time so it can include options such as ‘Go Shopping.’ Brands will be able to add up to five actions and will mean that users won’t have to remember specific text commands. When you are talking to a bot you know you are talking to a computer. You know you are not talking to a real person but you still want to have a bit of personality there. Facebook is now adding functionality to allow bots to send GIFs, audio and video to users to help them “get your brand’s personality across” and boost engagement. This has the natural benefits of it being a personal experience but also runs the risk of turning people off your brand. If you are asking a bot a serious question or you are unhappy with the brands service then the brand sends you a GIF of a cat you are unlikely going to be giving them your business. 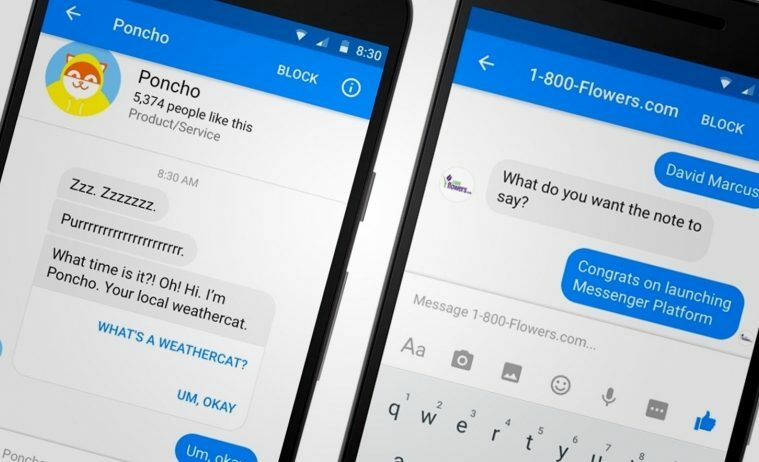 Facebook is also going to be adding the ability for businesses to connect their customer an Messenger accounts. You will also have the ability to mute bots to help avoid potential spam and a feedback system will be added to improve bot quality. Bots are clearly not up to the standards where we would potentially see a wider adoption of the service however there is clearly an interest from developers. Now Facebook just needs to improve the interest levels among average users. We knew bots were going to have their issues at the start, however there has been little improvement so far and the experience is still painful when you try to interact with one. Hopefully this will see the start of some major bot improvements. In the long term, better AI will be the answer.